Sign up to receive a weekly email preview of the following week's shows! Help BirdNote tell more stories, reach more people, and inspire action. What if you spent your life recording the sounds of the natural world, and then woke up to silence? Hear Gordon Hempton’s story in episode one. Click here to start listening. A symbol of the ancient druids returns! Golden Eagles were once revered as a symbol of wisdom and power by the ancient druids in Ireland. But the Golden Eagle’s voice was not heard in Ireland for most of the Twentieth Century. In the spring of 2007, a Golden Eagle pair hatched a chick for the first time since 1912, in Glenveagh National Park, in the far northwest of the Republic of Ireland. As of 2014, three pairs are nesting in the park. The partnership that brought these eagles to Glenveagh includes not only conservation groups but also local sheep farmers and surrounding communities, which hope to bring the tradition of the Golden Eagle back to Ireland. 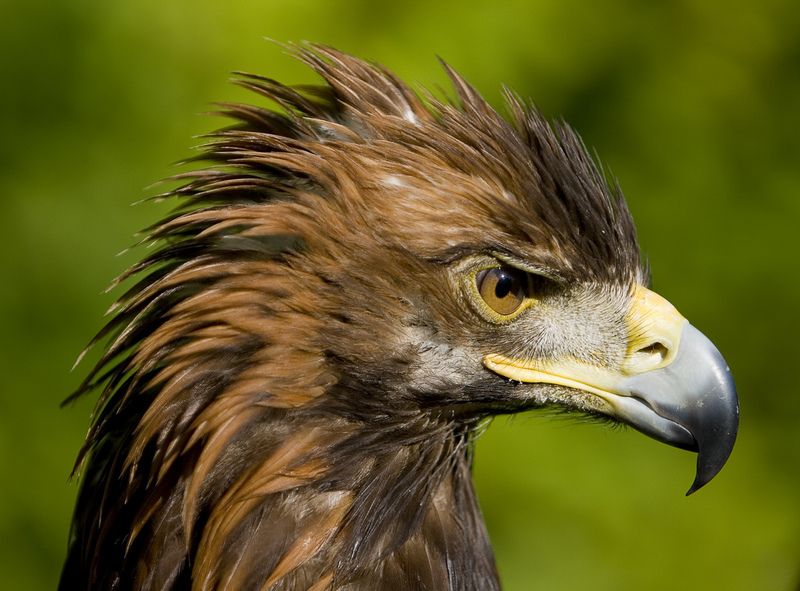 Golden Eagles were once revered in Ireland by the ancient druids, as a symbol of wisdom and power. And up till recently, you’d have been more likely to see an ancient druid than the bird they so admired. But that’s changing – slowly. Like many birds of prey, adult Golden Eagles establish their territory near their original nest site. [Call of a Golden Eagle, mostly in the background] The first two adults were introduced to Glenveagh Park as chicks, and they fledged in that area. Now there are three nesting pairs, though successful breeding remains tricky. This year, the first pair failed to hatch a chick because of heavy rains in April. A second pair that contained the first Irish-born bird also failed, possibly because they built their nest in too exposed a location. But a third pair did succeed in hatching a single male chick. 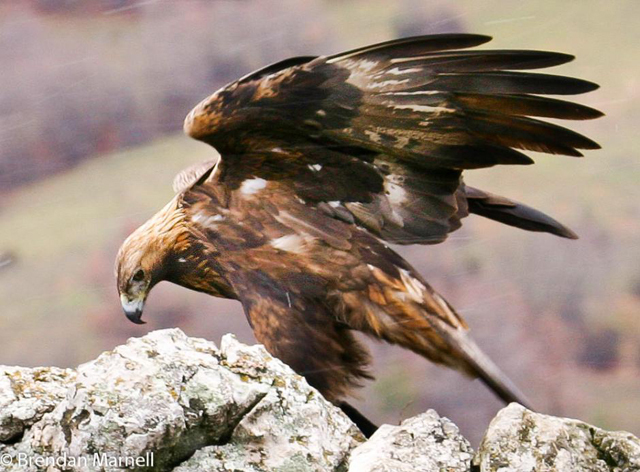 Golden Eagles everywhere face the challenges of habitat destruction and persecu-tion by humans. But the alliance that brought these eagles to Glenveagh includes not only conservation groups, but also local sheep farmers and surrounding communities. All hoping to bring the tradition of the Golden Eagle back to Ireland. Learn more on our website, BirdNote.org. Call of the Golden Eagle provided by The Macaulay Library at the Cornell Lab of Ornithology, Ithaca, New York. Recorded by A.L. Priori. BirdNote’s theme music was composed and played by Nancy Rumbel and John Kessler. © 2018 BirdNote, all rights reserved.